EDUCATE present & future generations about the aviation history of WWII Fighter Ace, David Lee "Tex" Hill and WWII military aviation. INSPIRE all ages to become part of the living history of WWII. HONOR the legacy of "Tex" Hill and all those who fought & flew in WWII. We are an all volunteer organization with a variety of ways that YOU can help. Join us in our mission to Educate, Inspire & Honor. We are a rapidly growing organization with lofty future plans. We need people like you! 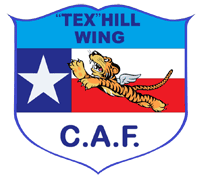 Join the "Tex" Hill Wing by submitting this form & paying dues. When you click the "submit" button above, you will be redirected to a new page to make your Membership payment of $50. You will be redirected AFTER you see the message that your message has been sent. The Commemorative Air Force is the world's largest flying museum with over 12,000 members and a large fleet of aircraft.